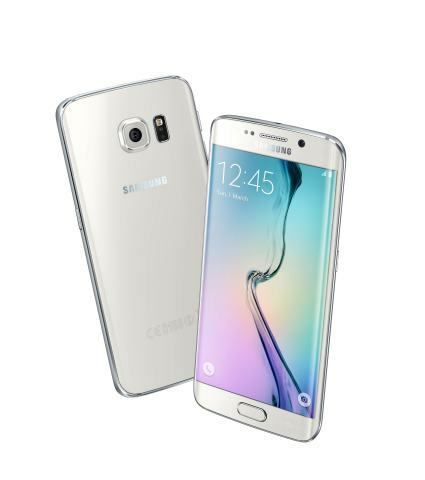 NEW YORK--(BUSINESS WIRE)--Lightweight metals leader Alcoa (NYSE:AA) today announced that it is supplying a high-strength, aerospace-grade aluminum to Samsung for its latest smartphones —the Galaxy S6 and S6 edge. 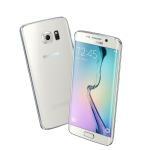 This marks the first time the global electronic giant will use an aluminum frame for its Galaxy S flagship model. The Company’s aerospace-grade aluminum, 6013 Alcoa Power Plate™, is 70 percent stronger than standard aluminum used in similar devices, creating a thinner, lighter, sleeker design. 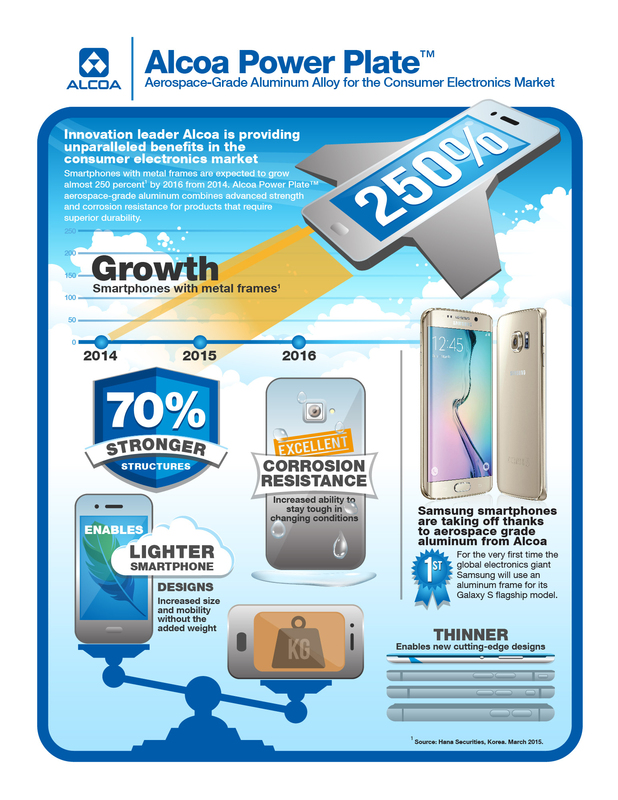 Smartphones with metal frames are expected to grow almost 250 percent1 by 2016 from 2014, creating stronger demand for aluminum to protect mobile devices. Developed by Alcoa Technical Center scientists, innovators in metal science, the Alcoa Power Plate aerospace-grade aluminum combines advanced strength and corrosion resistance for products that require superior durability. 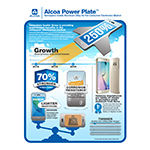 Samsung Galaxy S6 phones with Alcoa Power Plate are now available globally. Alcoa’s innovative technologies for the consumer electronics market support the Company’s broader strategy to grow its value-add portfolio. Other Alcoa consumer electronics solutions include ProStrength™, a proprietary surface finishing technology also using aerospace-grade aluminum for thinner, lighter and stronger mobile devices. Beautifully crafted from metal and glass, Samsung Galaxy S6 and S6 edge redefine what's next in mobility, with a timeless design and the most advanced features. Samsung Galaxy S6 and S6 edge offer the most advanced camera functionality including high resolution sensors, super bright F1.9 lenses, embedded Auto Real-time HDR, Smart OIS, and much more. They are also equipped with fast charging technology and embedded wireless charging compatible with virtually any wireless charging pad in the market. This release contains statements that relate to future events and as such constitute forward-looking statements. Forward-looking statements include those containing such words as “anticipate,” “believe,” “estimate,” “expect,” “forecast,” “goal,” “plan,” “potential,” “should,” “will,” or other words of similar meaning. All statements that are not clearly historical in nature or that necessarily depend on future events are forward-looking statements and speak only as of the date of this release, including, without limitation, statements regarding growth opportunities for aluminum in consumer electronics applications, including smartphones, the expected advantages of advanced aluminum alloys and technologies, and statements about Alcoa’s outlook, strategies and business and financial prospects. Forward-looking statements are subject to a number of risks, uncertainties, and other factors and are not guarantees of future performance. Important factors that could cause actual results to differ materially from those in the forward-looking statements include: (a) material adverse changes in aluminum industry conditions; (b) unfavorable changes in the markets served by Alcoa, including the consumer electronics market; (c) the possibility that certain assumptions regarding Alcoa’s products or technologies could prove to be inaccurate; (d) failure to advance or successfully implement, or to realized expected benefits from, new technologies or innovative products, including, without limitation, aerospace-grade aluminum or other advanced alloys or technologies, such as the 6013 Power PlateTM technology, ProStrengthTM finishing technology, or ColorKast™ die cast technology, whether due to changes in the regulatory environment, competitive developments, changes in consumer preferences, or other factors; (e) the business or financial condition of key customers, suppliers, and business partners; and (f) the other risk factors discussed in Alcoa’s Form 10-K for the year ended December 31, 2014 and other reports filed with the Securities and Exchange Commission. Alcoa disclaims any intention or obligation to update publicly any forward-looking statements, whether in response to new information, future events or otherwise, except as required by applicable law. 1 Source: Hana Securities, Korea. March 2015. Alcoa is supplying high-strength, aerospace-grade aluminum to Samsung for its new Galaxy S6 and S6 Edge smartphones. Alcoa Power Plate is 70 percent stronger than standard aluminum used in similar devices, creating a thinner, lighter, sleeker design. Alcoa Power Plate aerospace-grade aluminum for the consumer electronics market.